Alongside the exhibitions Luxlive had 4 theatres showcasing expert talks, case studies and demonstrations. 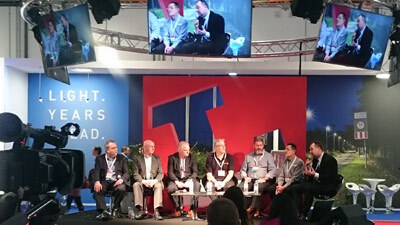 We were proud to see our very own Gerry Knowles taking part in the ‘Experts answer your lighting questions’ discussion in the Lux Arena. 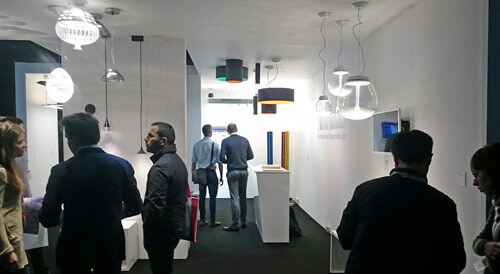 As a member of Voltimum’s panel of experts he, along with the others in the panel from Osram, Philips, Megaman and the LIA, tackled a wide range of questions from across the industry. I was impressed to see the show’s focus on end users across a full range of sectors from education and workplace to transport and outdoor. And I don’t think anyone will be surprised to hear that you couldn’t turn without seeing something related to LED. The lighting world is constantly evolving and seems to have fully embraced the potential in LED technology. As my first time attending the event I have to admit that I did ‘geek-out’ a little bit at the chance to see the latest technologies available, and I wasn’t disappointed! This year there was a large emphasis on the ‘Internet of Things’ (IoT). Companies are exploring the opportunities of integrating LED lighting with other digital technologies to create systems that provide a better experience for the user. Demonstrations of this took place across both days by the Gooee team at the IoT experience stand. There were also live demonstrations of Li-Fi; a new technology that transmits data through light and works as an alternative to Wi-Fi. In addition to new innovations, I was consistently reminded at just how easy it was becoming to use light more effectively. The flexibility and control offered through LED technology and their integration with user friendly apps are allowing businesses and consumers alike to become more creative with their lighting. The team at the Progress Lighting stand gave a great demonstration of how the average shop manager can create amazing window displays. Grouping lights, changing colours and adding effects were all available through the programmable mobile app. Simple. So if you didn’t make it this year then I recommend adding Luxlive to the calendar for 2016. Or, if the London show doesn’t sound appeal enough, next year Luxlive will be hosting a second show in Abu Dhabi. Now all I need to do is convince Gerry to let me go!